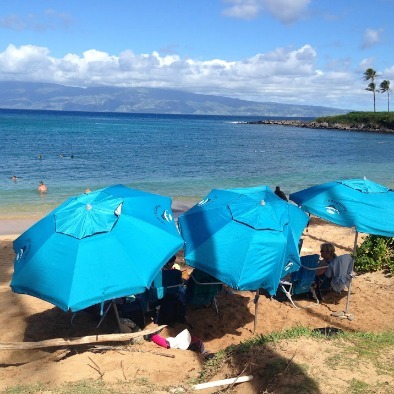 The best beach umbrella is one that provides enough shade - whether it is just for you, a sleeping baby, or for a couple of family members. It also needs to be stable and secure, resistant to the wind, easy to put up, as well as light weight and easy to carry. Beach umbrellas come in many different sizes and are made up of different quality fabrics. Some are quite flimsy, tear easily and don't hold up in the wind like the one pictured. 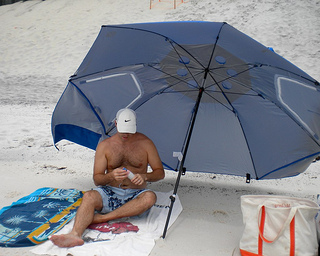 The one we always bring to the beach now is the Sport Brella. It is like opening up an umbrella. It can be positioned upright like this or on it's side. The pole is in two pieces. When you first get it you may think a part is missing - but the bottom piece is stored inside the shaft. To take down simply remove the stakes and release or lower the umbrella. Slide the lower pole section into the upper pole and put it into the over-the-shoulder bag. 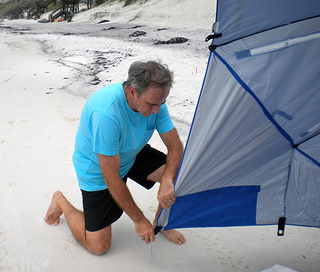 When on it's side, this beach umbrella provides more protection from wind and blowing sand. There are two window flaps that open up to get some ventilation and breeze. The side flaps are anchored down to keep the umbrella from blowing away. There are actually two different sizes for the Sport Brella - regular and the XL. The XL works well but it does not fit into the trunk of a regular car. You would need an SUV or truck to haul it. 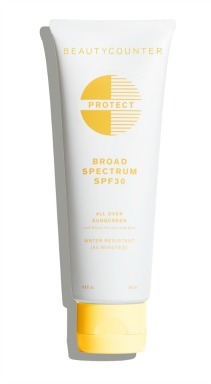 The regular size will fit two adults and some beach gear. 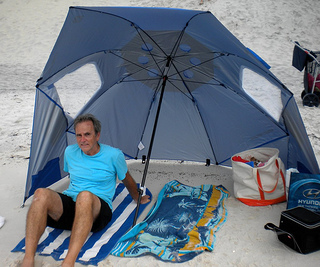 If you are looking for an easy umbrella to set up and take down, that also provides protection from sun and wind, the Sport Umbrella is the one for you. We always use an umbrella anchor to stabilize our umbrella. 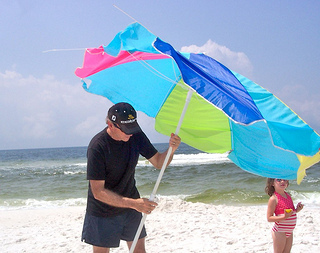 Wind at the beach is to be expected and it's best to be prepared for it or you will find yourself chasing down your umbrella as it flies across the sand. 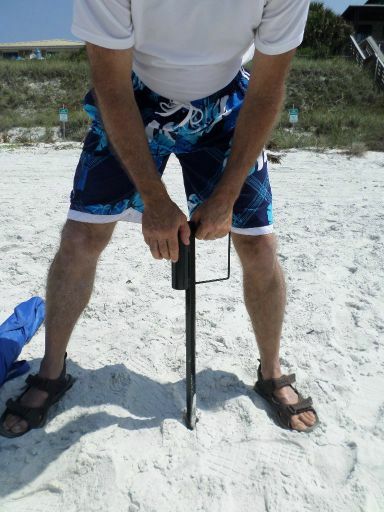 Screw the anchor down so that it is in the sand several inches deep. This guy will hold your umbrella down in just about any wind. Be sure that the diameter of your umbrella pole fits into the hole of the anchor - which most umbrellas do. Stop chasing your umbrella and get an anchor that will keep it secure. Often the storage or carrying bag that comes with your umbrella is made of cheap polyester fabric and while the umbrella may last many seasons, the carrying bag may not. When that happens replace the bag with a sturdy canvas carrying bag. Heavy duty shoulder straps make it easy to carry over your shoulder or use the short handle for simply carrying it. A draw string closure helps with storage. It measures 53" long and 12" wide and is available in navy blue. An inside pocket keeps the pole in one place and an outside pocket allows you to pack things like the stakes. Large Beach Umbrella Carry Bag - 53L x 12W in. 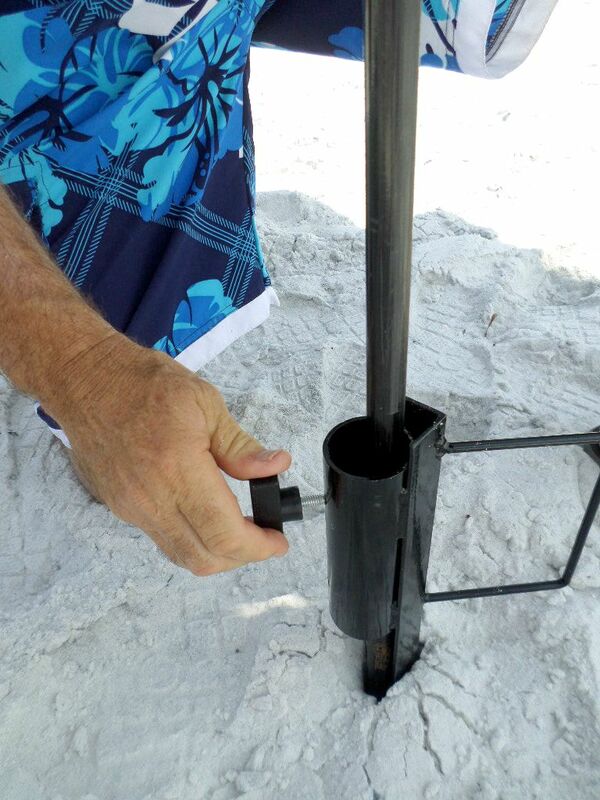 One way to secure your beach umbrella on windy days is to use a beach umbrella stand like this one pictured. Just push the pointed edge deep into the sand. If the sand is too hard you can tap it with a rubber hammer. Then place your umbrella pole into the round opening and secure the pole by tightening it with the screw. Made out of heavy duty steel this accessory and anchor will last you for many years. 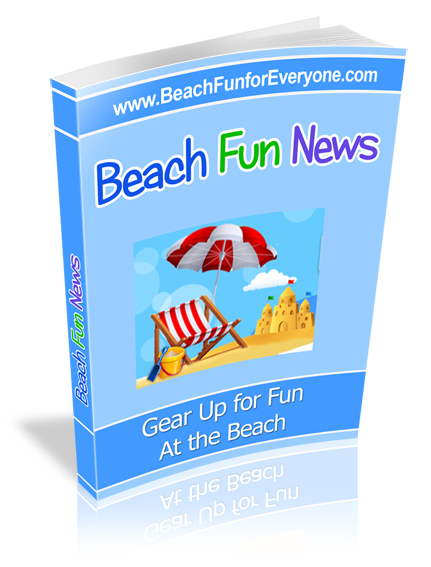 Looking for a colorful beach umbrella? Tommy Bahama makes one that comes in several colors and styles. 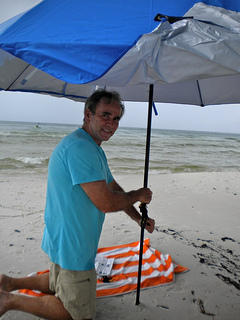 But it's not the color of the umbrella that makes this piece of beach gear great - it can tilt - just like patio umbrellas. 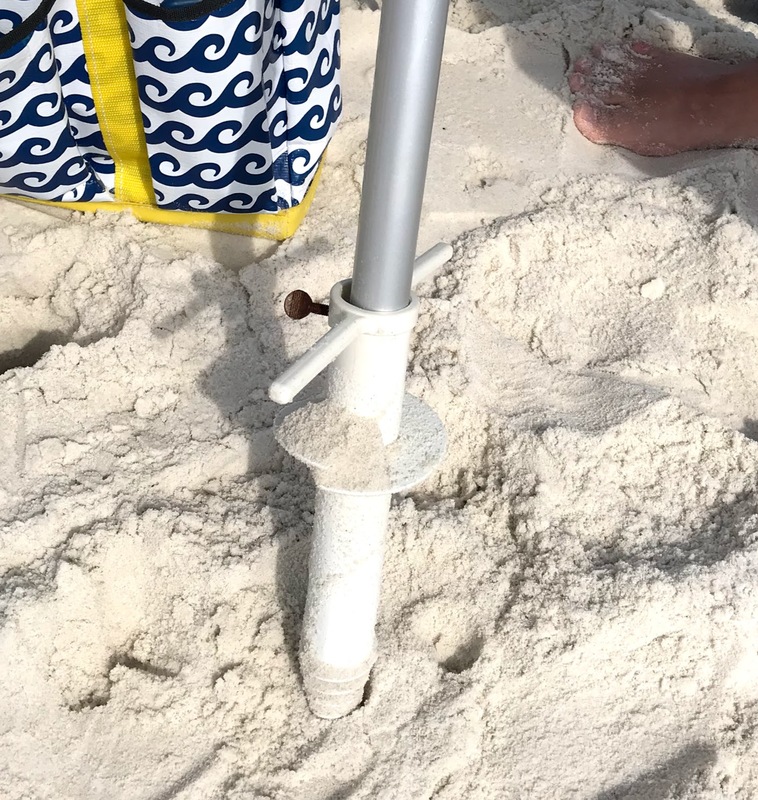 Anchor the umbrella in the sand by using the fold down handles to screw the pole for a secure placement. A wind vent helps to keep the air moving through the top fabric so it doesn't blow away. The canopy size is 7 feet and provides ample shade. The umbrella height is 95" tall from finial to tip of sand anchor.